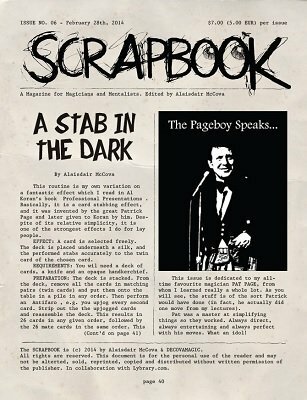 STAB IN THE DARK - A card stab routine, where you stab (underneath a silk) into the deck and hit the mate of a spectator's selected card. SIMPLE MISRES DREAM - This gimmick enables you to do a perfect coin catch without any sleight of hand! Can be applied to many other things as well. POOR MANS RINGFLIGHT - The easiest ringflight with an unprepared leather key case. This is really for the working performer and perfect for table hopping. GAELIC SWITCH - My utility switch which I developed more than 30 years ago. It is so convincing that even Pat Page used it in his work after seeing it in my lecture (which I am really proud of). TAMARIZ MEMO DECK DAY 4 - The next step in my little course in mastering the Mnemonica.